The adhesive you choose will depend largely on your application. Use the guide below to select the appropriate glue for your life science research application. Cyanoacrylate adhesives have been on the market since 1958. Most industrial or household grade cyanoacrylate is made of shorter alkyl chain derivatives such as methyl or ethyl cyanoacrylate (WPI #7341 and #7342). They are very useful for temporarily holding tissues such as mounting specimens for microtome sectioning. Cyanoacrylates Not Suitable for Live Animals Historically, cyanoacrylates have not been suitable for bonding wounds on live animals. The difficulties of using cyanoacrylate for bonding live animals include: a strong, irritating odor quick loss of bonding strength due to breakdown of the bonding by hydration the breakdown products (cyanoacetate and formaldehyde) are toxic and can cause inflammatory reactions they have low flexibility and tend to be brittle Butyl Cyanoacrylate Better for Surgical Applications To overcome these issues, several longer alkyl chain cyanoacrylates were developed especially for veterinary and human use. The first longer alkyl chain product is butyl cyanoacrylate. Butyl cyanoacrylate has been used for animal and human applications outside the USA since 1970. It is much less toxic and has a lower odor than the methyl and ethyl cyanoacrylates. Our VetBond is a butyl cyanoacrylate. New Octyl Cyanoacrylates are Even Better A family of adhesives containing octyl cyanoacrylate, a plasticizer and stabilizer, was developed In the 1990's (one of them approved by FDA for human use). When bonding to tissue, these new adhesives are four times stronger and less toxic than butyl cyanoacrylate. Compared with the traditional suture, the new super adhesive has several advantages. On average, it takes only one-tenth of the time to close an incision. The bonding strength is equal to 5-0 monofilament suture. It has a mysterious antimicrobial effect that can decrease infection rates in contaminated wounds. Bonding will slough off naturally in 5 to 7 days. Cosmetic appearance of the healed incision is also better. Gluture Topical Tissue Adhesive (WPI #503763), WPI's octyl cyanoacrylate, forms a strong and flexible film. This makes it more suitable for surface wound bonding, protection and holding a sensor or other device on the tissue. Setting time is about 10 seconds, which gives ample time for application, It can also be used for temporarily holding live tissue. For example, there is a report of using it to hold nematodes on a glass slide for patch clamp neuron recording. 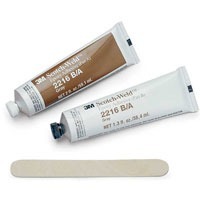 NOTE: All of the cyanoacrylate adhesives offered by WPI are veterinary grade. They are not suitable for human application. Though very similar to the grade for human use, they are not sterile and do not have FDA approval. Learn why the new cyanoacrylate adhesives are perfect for small animal surgery and veterinary use. A hot melt glue and a glue gun are handy for quick repairs and any number of applications in a laboratory. The adhesive you select will depend largely on your biomedical research laboratory application. If you are building electrodes, you might use a silver-filled, conductive epoxy to connect a Ag/AgCl pellet. For instantaneous bonding when mounting a rodent brain slice, you might select an ethyl cyanoacrylate. When you are looking for a low toxicity adhesive with some elasticity and good moisture resistance, a silicone adhesive is the option of choice. When used with living tissue, an adhesive must be: Non-toxic Able to adhere to organic and inorganic surfaces We offer a variety of silicone adhesives, which are popular for life science applications. Form strong bonding. Used in wire bonding applications. 4898 Silver filled conductive Epoxy 12 hrs@50C; 5 min @150C Connecting conductors that can't be soldered. Constructing or connecting Ag/AgCl pellets. 7335 Carbon filled conductive Epoxy 48 hrs@25C; 5 min @150C Constructing carbon electrode. 4886 High performance Structural Epoxy 12 hrs@25C. Forms a strong and slightly flexible bond on plastic, metal, and glass. Bonds some low surface . Easy to use for bonding, needs large gap filling. 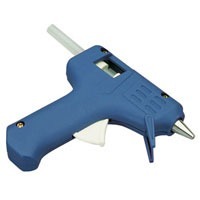 13316 Mini Glue Gun with glue sticks As soon as it cools down Bonds wood, glass, metals, and many plastics. Good moisture resistant and elastic. Low toxic. 1571 Room temperature vulcanizing (RTV) adhesive. Acyloxy/moisture cure system. Acetic acid is cure by-product. 24hrs@25C Has the best adhesion property in this silicone family. Will bond to many materials. 7128 RTV sealant. Alkoxy/Moisture cure system. Methanol as cure by-product. 72hrs@25C Good for bonding or sealing electronics circuits (metal). SYLG184 Sylgard, Two parts, vinyl/platinum cure sealant. Hydrogen as cure by-products. Very low toxic 24hrs@25C, 15 min. @150C Coating Patch Clamp electrodes, Cell culture dish, making dissection pads. 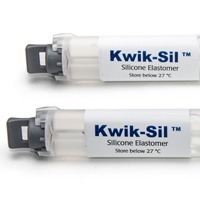 Kwik-Sil Two part, adhesive. Vinyl/platinum system, Hydrogen as cure by-products. Very low toxic. < 5 min@25C Live tissue and nerve studies. Medium strength adhesion. Kwik-Cast Two part sealant. Vinyl/platinum cure system. Hydrogen as cure by-products. Very low toxic. < 5 min@25C Sealant for live tissues. Embedding peripheral nerves with electrodes. 7341 Ethyl Cyanoacrylate, low viscosity 90-120 cps <10 seconds Mounting rat/mouse brain slices. Ideal for relatively small gaps and smooth surfaces.Bonds plastic, metals and rubber. Package of 10 vials, each approximately 1.5 mL. 7342 Ethyl Cyanoacrylate, high viscosity 1100-1600 cps <30 seconds Use on brain slice exp. Ideal for larger gaps, allows slightly longer bonding time. Bonds plastic, metals and rubber. Package of 10 vials, each approximately 1.5 mL. 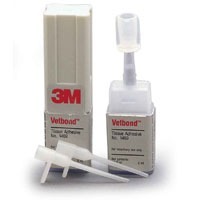 Vetbond Butyl Cyanoacrylate, Low toxic <10 seconds Bonds tissues, alternative to suture, helps small wound healing. Antimicrobial effect. Used in forensic science. 503763 Octyl Cyanoacrylate, Low toxic <15 seconds Suitable for surface wound bonding, protection, holding a sensor or other device on the tissue.